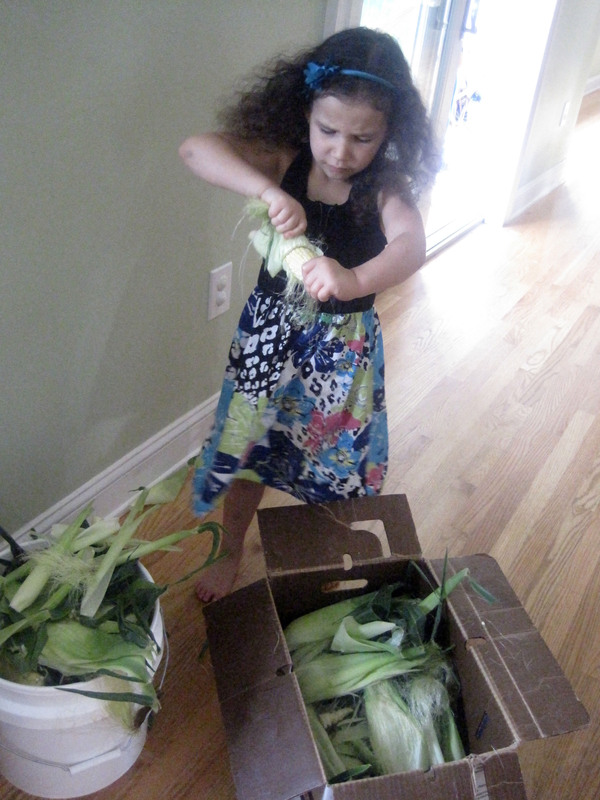 I have this delicious sweet corn from Denison’s Farm and a craving for Sweet Corn Cake or “Bolo de Milho Verde.” I have my mom’s recipe, but this is one of those recipes that I make while calling her in Brazil. This recipe does not give me all the details for me to make just like hers. This recipe does not come from a cookbook with exact measurements and I like that because it invites me to dialogue, to create and to embrace the new outcomes. I did not grew up with cook books. Maybe once in a while I would see a clip from a magazine, the back of a box or a pamphlet with a new food advertisement featuring recipes. What I did see and had and still do have are notebooks. When I moved away from home, to come to the United States, I copied my mother’s recipes into a new notebook to bring with me. She copied hers from her relatives, friends, and still writes them down when she makes something that turns out really good or she does not want to forget. When her notebooks pages would get too greasy or pages would start to fall off, she would ask me to copy the whole notebook. Those were nice summer projects I did as a kid. 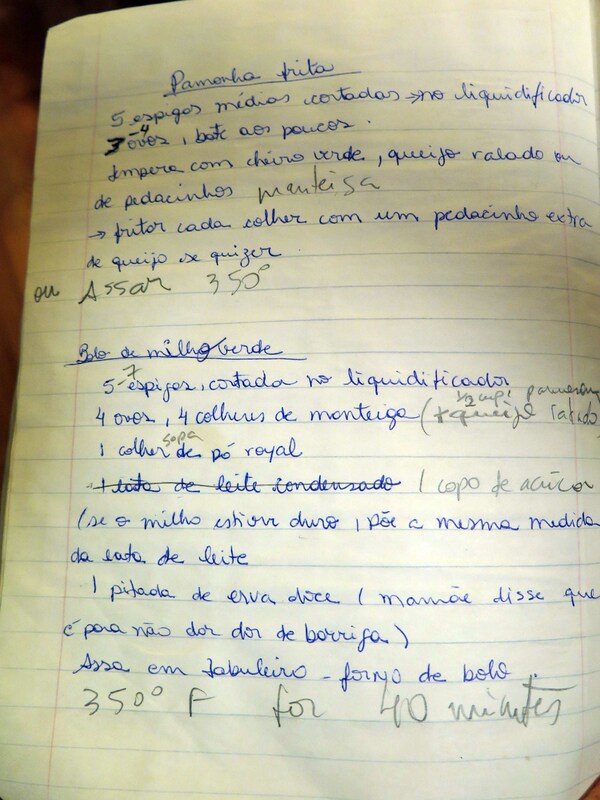 The old notebooks were passed down to another cook in training. The recipes have names like Aunt Zilma’s bread, Nelza’s torte or Dad’ Cheese. I wonder if this is why I have a passion for recipes. For me they are more than just instructions. Recipes are living connections to people and time. I treasure and work towards capturing the stories around them when they are happening and the oral history that does not come printed on a recipe card. Bolo de Milho Verde is a creamy corn cake, almost like a custard, but with the milk added only if needed. Mom says, make it sweet or salty — use the same recipe. So over the phone she tells me how to “adjust” the recipe I have in my notebook. “If you make it salty, you do not need the baking powder,” (not on the recipe). “Not only can this be baked, but also fried,” she added. The taste is of Pamonha, (similar recipe that is boiled wrapped in corn husks). In the end and I am very happy it turned out delicious, almost like mom’s! PS: I made the salty versions both ways and the second time I did add 2 tsp of baking powder in the salty version and like the results better. Add all ingredients in the blender and blend until smooth, add a few tbsp of milk if needed to keep blending. Bake in rectangle or bunt cake pan. Bake 350 for about 40 minutes and the top of the cake is golden color. 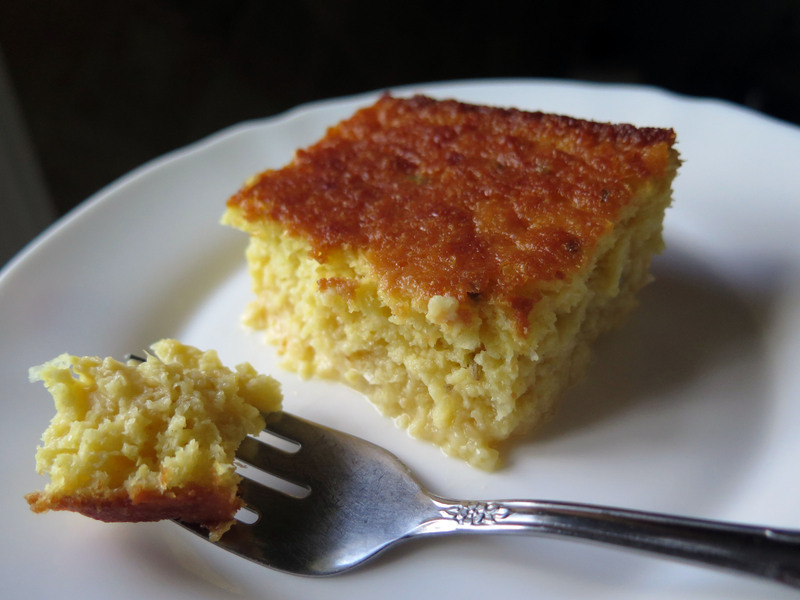 Salty Sweet Corn Cake — I am calling this a “suflê” ! 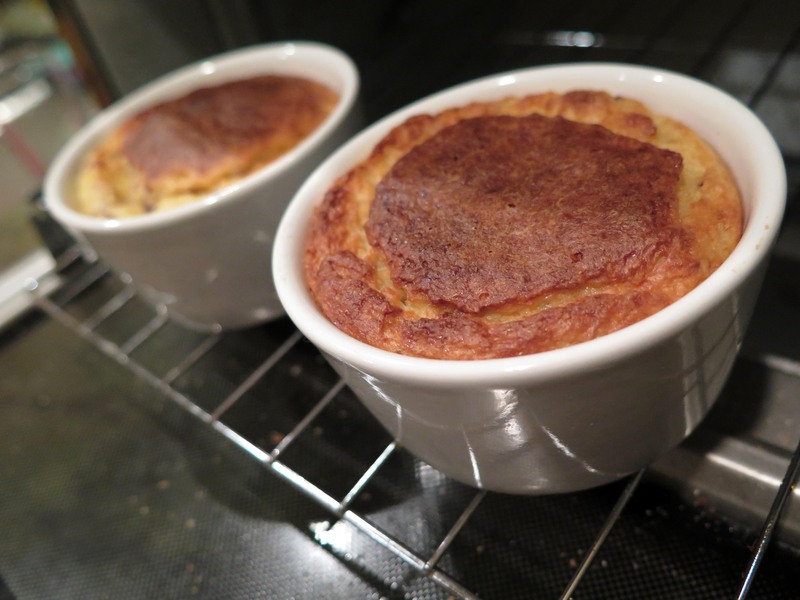 I used the corn from our garden to make this version and it is more like a souffle. 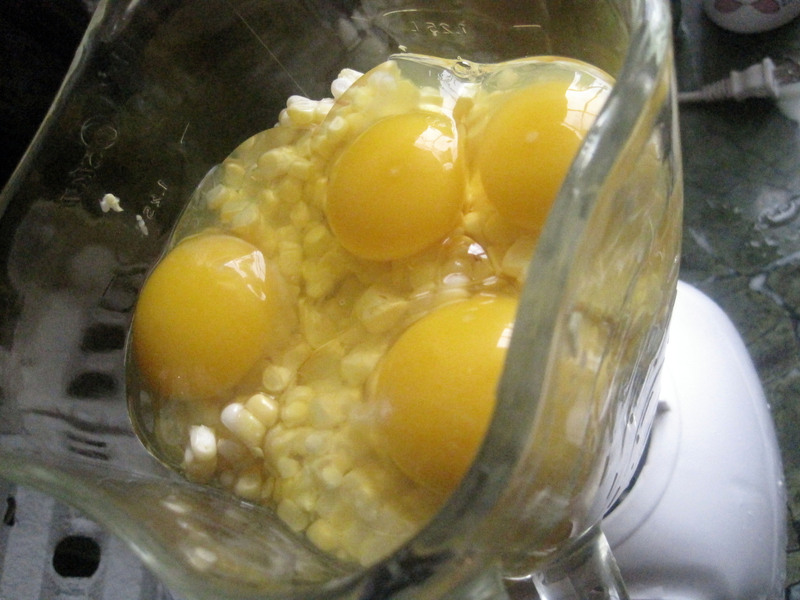 Add all ingredients in the blender and blend until smooth. Bake in 8 ounce size ramekin containers. Oven 350 for 25 minutes. Oooh. Can you ask your mom how much salt to add in the salty version next time you two chat? I’d love to make this as a savory on one of those summer days that I don’t mind firing up the oven. she is here now and we are making them soon 🙂 for this recipe she says 1 tsp salt. Made this tonight with the CSA corn. It was delicious. Thank you. I put the cobs in the slowcooker and when I wake up in the morning I’ll have corn stock (I guess technically its a broth). That’s going to be a fun treat too. 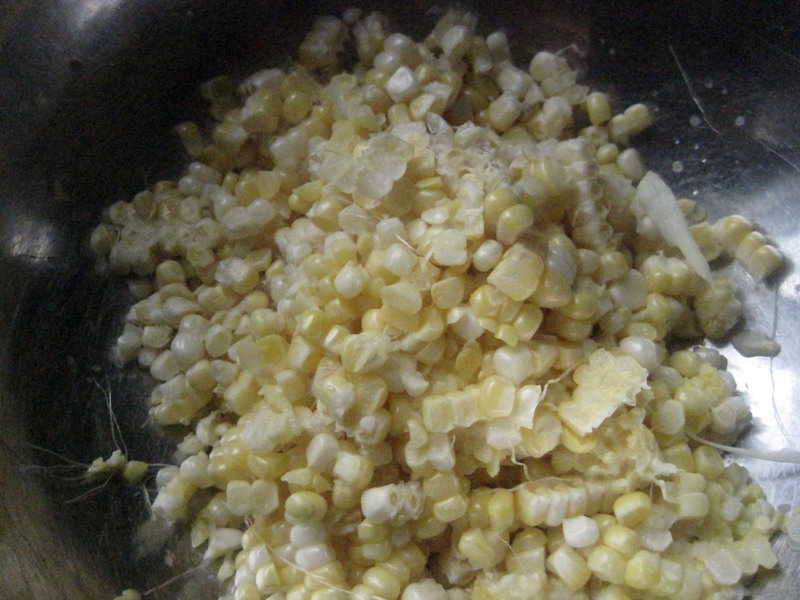 Hi Daniel, so happy you tried the recipe and saved the corn stock! I love cooking my rice on corn broth. I made this recipe again with small updates for the salty version. I added baking powder and garlic–it is like a suflê.